Europe's third Automated Transfer Vehicle (ATV-3) is named Edoardo Amaldi. This story was updated at 9:06 a.m. EDT on March 15. A robotic European cargo ship will launch to the International Space Station next week, after a minor packing glitch forced officials to delay an earlier liftoff. 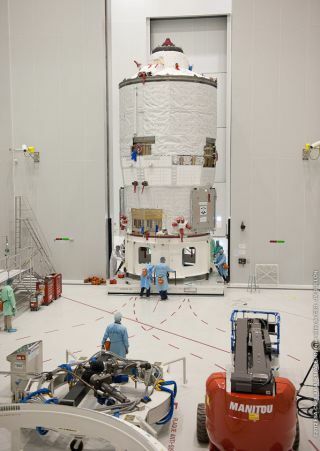 The European Space Agency's third Automated Transfer Vehicle (ATV-3) is slated to launch into orbit on March 23 at 12:34 a.m. EDT (0434 GMT) from Kourou, French Guiana. The 20-ton unmanned cargo freighter will ride into space atop an Ariane 5 rocket. The ATV-3 was originally scheduled to launch toward the space station on March 9, but during a routine pre-flight inspection, ESA officials noticed that two cargo bags were not properly strapped into place. As a precaution, the hatch of the spacecraft was re-opened and the cargo bags were adjusted to make sure they do not move or fall during the flight. The cargo ship will now arrive at the space station on March 28 at 6:34 p.m. EDT (2234 GMT), NASA officials confirmed. The European ATV vehicles are designed to automatically dock to the Zvezda module on the Russian segment of the orbiting outpost. The spacecraft then remains attached to the station for up to six months before it is packed with garbage and deliberately sent to burn up as it re-enters the Earth's atmosphere. ESA named the ATV-3 Edoardo Amaldi after the Italian physicist and spaceflight pioneer. The spacecraft is packed full of supplies and propellant for the space station and its six-man crew. The cylindrical freighter is 35 feet (10.7 meters) long and 14.7 feet (4.5 meters) wide. The giant cargo ship is large enough to fit a double-decker bus inside. The ATVs are part of an international fleet of disposable robotic cargo ships that are used to transport supplies and hardware to the space station. Russia's robotic Progress ships and Japan's H-2 Transfer Vehicles also regularly make trips to the orbiting complex. ESA's ATV vehicles are named after historical figures that were influential to space exploration or science. The first ATV, named Jules Verne, launched in 2008. The agency's ATV-2, dubbed Johannes Kepler, launched in 2011. The next two planned ATVs, named ATV-4 Albert Einstein and ATV-5 Georges Lemaître, are scheduled to launch to the International Space Station in 2013 and 2014, respectively. Editor's Note: This report was changed to correct the ATV-3's launch and docking time based on updated information from NASA.